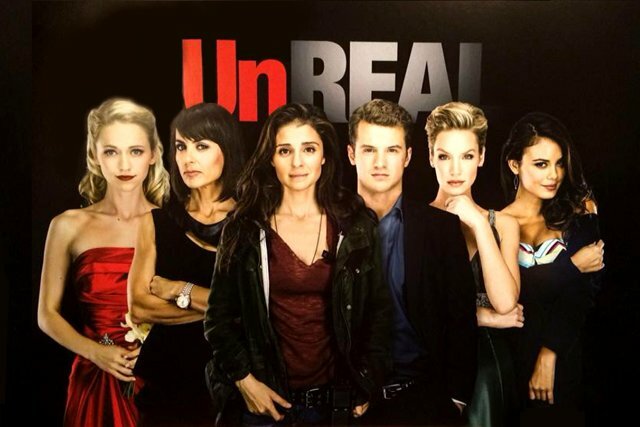 The Custard TV: Could UnReal be a new US hit?? Could UnReal be a new US hit?? Will you stay please? After sampling the first episode of Lifetime’s drama UnReal, I gleefully said ‘yes’. UnReal peels back the layers of a faux reality dating show called Everlasting. This ten episode show delves into the psychological and physiological impact Everlasting has on its contestants (known as subjects on the show) and the production crew. Though UnReal is not the first show to examine a television show from both sides of the camera, it is probably one of the darkest portrayals. BBC Two’s An Adventure in Space and Time, and ITV’s Moving Wallpaper are two programs I enjoyed that share a similar premise. An Adventure in Space was a well-crafted production that focused on the creation of Doctor Who; Moving Wallpaper was a satirical look at producing a soap opera. Unlike the previously mentioned shows, UnReal is a harsher examination that prides itself on dismantling its characters. The series was co-created by Sarah Gertrude Shapiro and Marti Noxon, former Executive Producer on Buffy the Vampire Slayer (BTVS). Shapiro and Noxon also co-wrote the first episode entitled Return. Do not let Marti Noxon’s BTVS credentials fool you; she has experience working on a variety of non-supernatural shows including Grey’s Anatomy, Glee, and Mad Men. If you are familiar with The Bachelor and notice some similarities, blame co-creator Sarah Gertrude Shapiro. Shapiro is a former producer on the American version of The Bachelor. She also wrote and directed a short film entitled Sequin Raze; the film inspired the Lifetime show. In America, The Bachelor and its spinoff The Bachelorette have occupied timeslots on ABC since 2002. Americans appear to enjoy televised courtship dramas that rarely end in long-term successful relationships off camera. A U.K. version of The Bachelor transmitted on (the soon to be lobotomized) BBC Three and Channel 5 for five series between 2003 and 2012. ITVBe aired series sixteen of The Bachelor (U.S.) earlier in 2015. UnReal is primarily populated with little to unknown actors and actresses. In my opinion, this raises the stakes because viewers come into the show with little or no bias. This is important in a series in which characters will abruptly depart. The production staff is anchored by Executive Producer Quinn King (Constance Zimmer from Entourage), and Producer Rachel Goldberg (Shiri Appleby from Roswell, Chicago Fire, and most recently Girls). Suitor Adam Cromwell is portrayed by Freddie Stroma from the Harry Potter films and The Inbetweeners 2. Episode one does a wonderful job of driving home the importance of this trio and establishes their relationships with the other characters. Almost every scene has a direct or indirect impact on Adam, Quinn, or Rachel. At times I found my being a little intimidated by the number of characters being introduced. Viewers should primarily focus on Adam, Quinn, and Rachel for the first episode if the onslaught of names is unbearable. If the first episode of UnReal is any indication, viewers will need to watch closely or they may miss a bit of subtext. Personally, I believe that UnReal should turn the show’s hidden messages into some sort game. Quinn gets this game of ‘find the subtext’ off to a roaring start by making racist remarks about a black subject’s forename. She is reminding the audience that ethnic minorities really win reality dating shows. Those lines of dialogue definitely earned the show its 10 PM timeslot. Individuals who are familiar with The Bachelor will appreciate the sequence in which Adam first meets the various contestants. When I initially saw the blood red colored font used in UnReal’s title card, I thought it was some sort of mistake. After watching the entire episode I realized the title card was foreshadowing the psychological horror inflicted upon Rachel and the other characters. One of the biggest examples of subtext in episode one is Rachel herself. Clearly Shapiro endued Rachel with some of her personal characteristics. In interviews given to The Hollywood Reporter (THR) and the L.A. Times, Shapiro discussed her interest in making feminist films and how miserable she was working on The Bachelor. Rachel is a self-described feminist who hates her job and feels trapped working on Everlasting and it shows. She walks around the set looking dirty, tired, and is possibly malnourished. Part of UnReal’s charm, in this reviewer’s opinion, comes from exploring the notion that reality shows are in fact staged. In addition, UnReal’s willingness to push characters to their breaking point helps distinguish it from similar shows. For instance, the vitriol spouted by Britney (The Vampire Diaries’ Arielle Kebbel) after Rachel manipulated her during the exit interview gave me a chill. However this story device should not be used haphazardly. Audience members may be unwilling to invest in UnReal’s most obvious victims, the subjects, because their journey could end at any moment. Characters such as Adam, Quinn, and Rachel must exhibit some redeeming qualities if viewers are going to invest in this show. Rachel’s reluctance to manipulate the contestants should earn the character empathy from the audience. Nearly everyone behind and in front of Everlasting’s cameras is a victim of the show waiting to be devoured. Hopefully Noxon and Shapiro will remember to make the production crew slightly sympathetic throughout series one, otherwise viewers may reject Adam Cromwell’s offer. Unreal is now available on Amazon Prime Video.